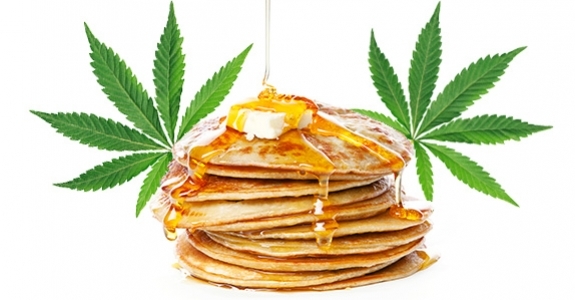 When you have the munchies there’s nothing quite like pancakes laced with weed and dripping in warm maple syrup to stroke your craving. There is an easy way in which to tackle the job of pancake-making, or if you enjoy your kitchen then there are some very time-consuming methods that you most definitely will want to undertake BEFORE sitting back with that tope. First let’s look at the easy option. Make sure you have a box of store-bought pancake mix in your pantry so that when that craving strikes you can throw together a batch in a jiffy. The only problem is that store-bought products don’t contain cannabis. Well, no problem really. Just throw a handful of weed into the dough, mix well and enjoy the after-glow. But feeling high will take time to set in unless you decarboxylate your weed. Decarboxylate what, you may ask? Never mind, more of that later because now we have to take a look at that time-consuming method of making pancakes. Now here you have two options. You can elect to add ½ tsp vanilla essence and 3 tbsp of sugar to the mix, or sprinkle the cooked pancakes with a mixture of cinnamon and sugar. I far prefer the latter choice as the mixture is lighter and you can sweeten your pancake to suit your own taste. Place all the dry ingredients into a mixing bowl and blend together evenly. In a separate bowl, whisk together all the wet ingredients. Now add the dry ingredients to the wet ingredients and whisk until light and fluffy. Put just enough oil to coat the bottom of a frying pan and when hot pour a thin layer of the mixture into the pan. REMEMBER these are pancakes, and not flapjacks or crumpets! Cook for a minute or two until the pancake mixture begins to bubble and then flip them onto the opposite side to complete the cooking process. Pancakes must be thin and cooked on a medium to high heat. Just take care not to burn them. Cooking a pancake takes no more than a minute or two. Place the cooked pancake onto a heated oven-proof plate, sprinkle with the cinnamon sugar, and repeat the process. This recipe should make 10 to 12 medium-sized pancakes. Oh, and don’t forget that maple syrup that no self-respecting pancake can be without. The good news is that you can make the mixture in advance and refrigerate. Just cover the bowl with cling wrap. Just remember to take the bowl out ahead of time to allow the mixture to return to room temperature before cooking. Decarboxylation is always recommended when cooking with cannabis because it releases the psychoactive effects of the THC that makes you stoned. Oven temperatures are 175F or 295F depending on the THC content. Place ground cannabis in a deep baking dish and cover with tin foil. Choose the lower temperature for THC content of between 3 to 5 mg/g and the higher temperature for weed of between 10 to 15 mg/g. You need to bake the weed until it is lightly toasted so keep an eye on its progress to make sure that the THC is fully activated. If couch-lock has set in and there is no store-bought pancake mix in your cupboard and you are most certainly not capable of whipping up your own pancake mixture, then having a bottle of maple syrup laced with weed in stock ensures that the battle isn’t entirely lost. After all syrupy bread can taste wondrous at times, right? Place a heat-resistant bowl over a pot of boiling water and heat the syrup. If you have a confectioner’s thermometer, the desired temperature is 160F. If not just make sure to submerge the weed wrapped in a cheesecloth bag, or clean tea towel for that matter, before the syrup reaches boiling point. Make sure to leave some of the cloth hanging out so that you can retrieve it at the end of the process without scalding yourself. Infusion must take place for at least two hours so keep an eye on that water level at the bottom of the pot. Basically the desired effect is that you are steaming the weed inside the syrup, so the temperature must not exceed anything above a low simmer. Once infused, allow the mixture to cool down before squeezing that last drop of cannabis into the bowl to ensure that you don’t lose one iota of that sweet tasting goodness. There is nothing in the rule book that says you can’t enjoy both weed-laced pancakes and weed-infused maple syrup at the same time.